Around 85 percent of women have cellulite somewhere on their bodies. Part of the reason why cellulite is such a widespread problem for women is that the condition can be difficult to treat. The fatty deposits that give rise to that dimpled, orange peel skin lay deep beneath the skin in the subcutaneous level of tissue. Most skin care products are only capable of penetrating the outermost layer of tissue, the epidermis, and never deliver their cellulite-fighting ingredients to where the problem tissue is actually lurking. The CelluliteRx skin care collection differs from these other formulas, thanks to its revolutionary encapsulated ingredient delivery system. The CelluliteRx skin care collection is a three-step system designed by a master esthetician and a health educator. This pair of women understands the many challenges that come with treating cellulite, and so they worked with medical scientists to develop the QuSome delivery system, which packages the brand's proprietary complexes into tiny capsules that are easily absorbed by the skin. By traveling deep into the skin tissue, CelluliteRx products burn cellulite and dramatically improve skin's texture. Unsightly cellulite can diminish your skin's appearance and perhaps even your self-confidence. CelluliteRx products work to reduce the appearance of cellulite in a safe and effective way. This brand was built on years of scientific research--the company consulted with scientists across the globe for more than two years before perfecting its products. At the same time, CelluliteRx also interviewed women who deal with cellulite to understand what types of products real women need. After this thorough scientific and market research, sisters Jeri and Lyn Ross launched the CelluliteRx brand with a goal of providing cellulite-reducing solutions for women just like you. The Atlanta-based CelluliteRx brand has developed its products with a results-oriented mission. CelluliteRx creates its products for women and by women, striving to give its customers the results they desire. As a cosmeceutical, CelluliteRx combines the benefits of both cosmetic products and pharmaceuticals, allowing you to enjoy significant benefits. This three-step product regimen works to restore your skin's health and beauty and rejuvenate it at the same time. The popularity of this brand is evident in its worldwide reach--as recently as November 2013, CelluliteRx products continued to expand their reach, including new partnerships established in Singapore. These products have also been featured in media outlets such as DaySpa Magazine and international television shows such as Vivilani. At SkinStore, you can find all of the products needed to establish an effective cellulite-fighting regimen. Enjoy the look of smoother skin by investing in the CelluliteRx system. You will love the results. Dimples on the cheeks might flatter your smile, but dimpled thighs do not. Fight that irksome, hard-to-eliminate cellulite with CelluliteRx Products. In order to find a truly effective cellulite treatment, you must discover a formula that includes proven, powerful ingredients that work well independently and in combination to fight cellulite. CelluliteRx Products do just that, using a high combination of active ingredients to firm and smooth your skin. Using a patented encapsulation delivery system, CelluliteRx Products ensure product penetration throughout the day thanks to their time-released delivery. Thus, your skin will enjoy the benefits of these products all day. CelluliteRx Products can be used individually or as a complete system to create healthier, younger-looking skin. You can restore moisture to dry, dehydrated skin, soften your skin, or firm sagging skin in addition to treating cellulite. These highly effective products mix well into your existing skin care routine, allowing you to regularly fight cellulite and other signs of aging. If other cellulite treatments have left you disappointed, try a new approach. Turn to CelluliteRx Products for all of your skin care needs. Treating cellulite does not require costly and time-consuming in-office visits. You can smooth out dimpled, sagging skin easily and efficiently in the comfort of your home with CelluliteRx Products. Use these products together into one comprehensive system, or mix and match them depending on your specific skin needs. Sea mineral algae and walnut shell combine to create a rejuvenating treatment in CelluliteRx LipoSmooth Body Polish by Institut DERMed Body. This body polish exfoliates the surface of your skin, sloughing away the dead cells that leave your skin looking dull. This product works well alone or as the first step in the CelluliteRx System. By working with the epidermis, this body polish softens and smoothes your skin while promoting new cell growth. The result is a healthy glow every day. 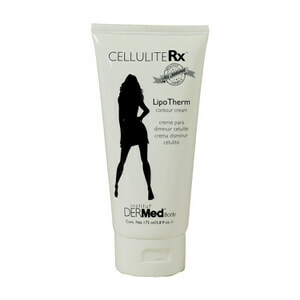 Say goodbye to dimpled skin and cellulite withCelluliteRx LipoTherm Contour Cream Institut DERMed Body. This cream boosts your skin's smoothness by reducing the appearance of cellulite while slimming your body. This cream features natural stimulants that encourage your body to burn fat for energy, thus depleting fat reserves in your body. You can also control and reduce cellular inflammation and balance hormones with this cream. Use once a day for maximum results. CelluliteRx LipoLift Firming Cream by Institut DERMed Body combines matrixyl peptides, glycolic acid, and an advanced liposome penetration delivery system to encourage collagen production. As a result, this cream can firm your skin, while improving skin tone, thickness, and elasticity. Target sagging skin around the neck, knees, or abdomen with this proven treatment.